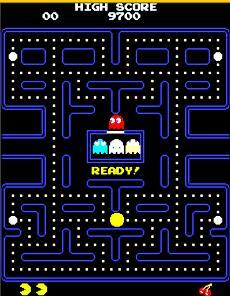 It was 30 years ago today that Pac-Man started gobbling your quarters. Google, which regularly features header art celebrating a theme or event, is commemorating the birth of the famous video game with a free interactive version on the Google home page. Hit the “Insert Coin” button below the search window and the game will begin. You direct Pac-Man where you want him to go by placing your cursor ahead of him and clicking. This entry was posted in Skiffy and tagged Google, video games by Mike Glyer. Bookmark the permalink.